El Rastro de Madrid is the largest and most popular flea market in Spain. El Rastro means ‘The Trail’ and, unfortunately, this isn’t nearly as innocent as it sounds. I initially thought the name derived from the fact that the market’s located along a long street, but no, no, no. Trading has been going on at El Rastro for more than 500 years and there’s a distinct lack of carcass dragging these days. The market covers quite an expanse of streets and can be accessed within a short walk from Tirsa De Molina (Blue Line 2), Banco de España or (Red Line 2) on the metro. It’s pretty difficult to miss, tbh, and we literally followed the crowds until we saw the familiar white topped stalls. The official address is between Plaza de Cascorro and Ribera de Curtidore, should you be using Google maps or some other new-fangled directional aid. The market trades every Sunday (including most public holidays) and opens at 9am. If you want to wander before the crowds get too overwhelming, aim to arrive between 9am-10am. The crowds are generally at their heaviest around 11am and will then tail off in the early afternoon, around 1-2pm. Depending on the season and the weather, stalls will generally be closed by 3pm. El Rastro Market has a variety of goods for sale at its stalls. There’s an abundance of silver jewellery, leather, scarves, jeans, kids clothing and lots of slogan t-shirts. An occasional stall, piled high with clothing, will offer the chance of unearthing a hidden gem for €1-2. Sadly, I’m quite lazy when it comes to rummaging. I gave them a cursory glance and delved no further. There are both new and used items for sale and, as well as the market traders themselves, the antique stores and boutiques in the surrounding streets are also open. If you’re looking for high-end items, this isn’t necessarily the market for you. However, if you’re looking for souvenirs to take home, or a token from your trip, you’ll find plenty to spend your money on. I bought a top and a scarf for the grand total of £15 and was in love with the different styles I found that were unlike anything I see at home. Take cash with you. It’s unlikely you’ll be able to pay with a card; particularly on the stalls. You can use credit and debit cards in the stores in the surrounding streets. Hard cash will be needed for everything else. Watch out for pick-pockets. This is common sense for any city, so it’s certainly not just a rule for Madrid. However, as El Rastro can get very busy very quickly. You can find yourself squishing up against people for the majority of your visit. Being bumped into isn’t uncommon, so do keep your hand on your bag or wallet while you’re in the crowded streets. Do like a local and hit up a local bar or cafe for cerveza and tapas once you’re done shopping. The whole experience is such a tradition, that it would be rude not to join in, no? The local watering holes can get very crowded, so you might have a wait to be seated. We wandered a short distance from the market and out of the crowds. We found ourselves a pretty pavement cafe to rest our weary legs and enjoy a cortado. 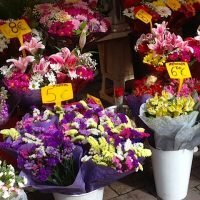 Have you visited El Rastro Market in Madrid?